, a dissenting minister, was the son of a merchant in London, and was educated with Butler and Seeker, afterwards eminent prelates in the church of England, under the learned Mr. Jones, at Tewkesbury, in Gloucestershire, from whose seminary he removed to Utrecht, in Holland, pursued his studies with indefatigable zeal, and took his degree of doctor of laws. While he was in this city, he changed his opinion concerning the mode of baptism, and became a baptist, but occasionally joined in communion with other denominations. On his return to England, he settled in London or Colchester, and devoted his time to various learned and useful treatises. In 1725 appeared his “Essay towards a Demonstration of the Scripture Trinity,” without his name, which was for some time ascribed to Mr. James Pierce, of Exeter. In 1738, a second edition, with some enlargements, was sent out from the press, and in both editions the author’s friends have laboured to prove that dishonourable methods were taken to prevent the spread of it. A new edition of this Essay, freed from the learned quotations with which it abounded, was printed, some years back, in 4to, and, without any dishonourable means, added very little to the Socinian cause. 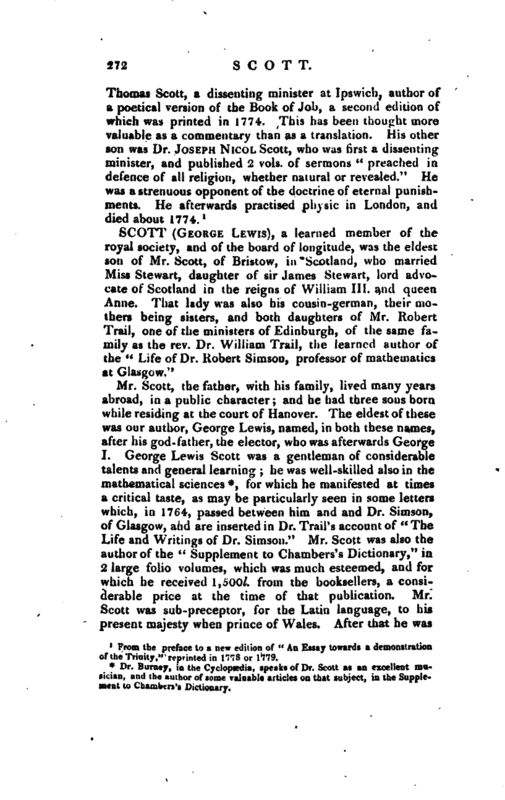 In 1741, he appeared to more advantage in “A New Version of St. Matthew’s Gospel, with Critical Notes and an Examination of Dr. Mill’s Various Readings” a very learned and accurate performance. At the persuasion of his dignified friends, Seeker and Butler, to whom he dedicated his work, he published, in 1745, in two volumes, folio, an “Appendix to H. Stephen’s Greek Lexicon;” a monument of his amazing diligence, critical skill, and precision. He lost several hundred pounds bj this publication, and, by his close application to it for many years, broke his health and spirits. 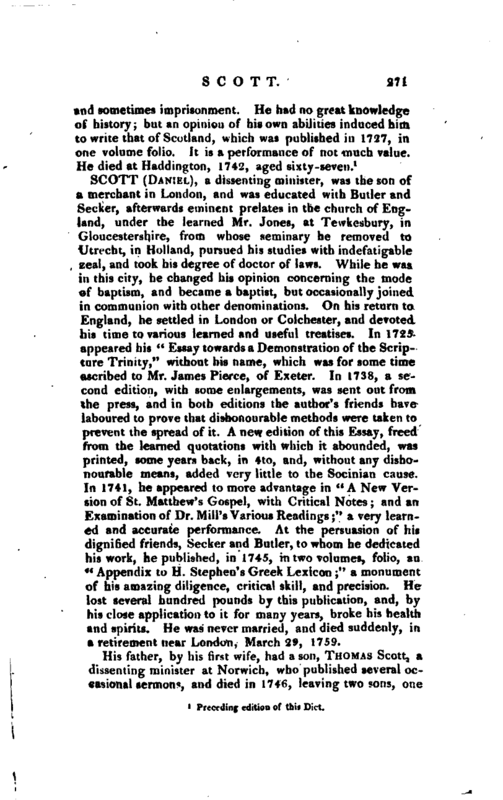 He was never married, and died suddenly, in a retirement near London, March 29, 1759. From the preface to a new edition of “An Essay towards a demonstration of the Trinity,” reprinted in 1778 or 1779.